Morning yoga is fantastic. It really improves my Fridays. I tweaked my elbow just enough yesterday while seeing if a one-armed americana would work in BJJ, that I opted NOT to climb after yoga this morning... which is more than a little sad. I think I have mentioned before that combining the physical meditation of Yoga for an hour with an even more private physical meditation on a rock wall is one of the best ways to start any day. Positive, strong, amazing feelings and outlook lasting all day! Another reason I didn't climb - is I'm Wolverine for my corporate Halloween party today, so I had some costume related stuff to do for that. Yay! 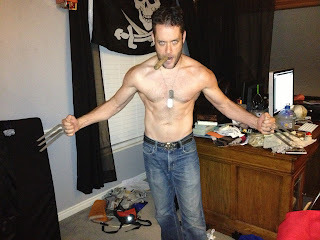 Here I am last night messing with the claws and cigar... I will be wearing a shirt and possibly my leather jacket for the company costume parade!! I did consider just doing a tank top, but decided against it in the end. Since this is my fitness blog and I was just about to do pushups - you get the shirtless version. 2 weeks ago Micah (BJJ Instructor) had back surgery to repair a couple of his lower vertebrae. So Mark, basically the only guy other than me that's been going lately thought we should keep practicing, which is great. I mentioned LAST Thursday that it has been a while since I have just 'rolled' (practical practice - basically just start wrestling/grappling trying to sink submissions/chokes/etc.) and for some reason my brain was having a hard time wanting to. So I needed to. So the past few times we've done that at the end, stopping occasionally to discuss issues and problems and solutions - and it has been fantastic! Even better this week, Micah has come to watch and give tips. Yesterday (again 2 weeks out from back surgery) he got into it a bit more. Hearing tips while rolling is really a great way of learning. I'm very pleased with the progress I am feeling with BJJ. I'm still WAY far from knowing what to do in many situations, and I pretty much always lose while rolling, but I'm excited in the direction! Other than Yoga Mondays, Wednesdays and Fridays, and BJJ on Tuesdays and Thursdays - not much else has been going on fitness wise. I still do pull ups and push ups - L-sit Pullups and Chinups after Yoga and/or BJJ usually - but I just realized I haven't done a muscle-up in WAY too long! (like a week and a half or two weeks!) That's no good. Gotta keep that strong. With the bad weather I wonder how useful my pullup bars are... I should do something to winterize them a bit. Another thing that is lacking in the past week - Trail Running!! Sure I ran almost 20 miles last Friday... but I miss the mountains! A Few More Mudder Pics! Yay Finally made it back to Crossfit!